The low-end model in the NEX lineup has hit version three, with the F3 now replacing the 3C (which replaced the original NEX-3). Each generation has gotten a little more sophisticated, though it has a modest US$600 list price (with kit lens). The big visible changes are the addition of a built-in pop-up flash and a tilting LCD that can flip around to be viewed from the front of the camera. A close examination shows that the body has grown a bit in size and adopted a look closer to that of the other NEX models, including a more prominent grip. Overall, it's still a small camera. Lenses tend to dictate the overall bulk of a NEX model, anyway, so the size change really isn't substantive. Inside, the 16mp sensor has been updated slightly, as has the BIONZ processor. The camera now outputs the highest level of video as AVHCD at 1080i/60 or 1080P/24, a step up from the C3 model. One slightly questionable change is the loss of a separate charger: the camera now charges via USB connector. The CIPA-specified battery life is 470 shots, so you need to find a USB port to connect to every 500 shots or so or you'll be breaking down and buying a charger along with extra batteries. At least the battery stayed the same, so NEX-3 or 3C users moving up will be happy. Another change that is welcome is the new accessory port, which allows you to use an optional EVF, microphone, and other yet-to-be-announced accessories. Overall, the changes are not dramatic, but they do make the NEX-F3 a more competent all-around camera. With the US$50 price drop, Sony is showing that they want to be aggressive in this market. Still, it isn't the NEX cameras that I've had problems with, it's the lack of suitable lenses. 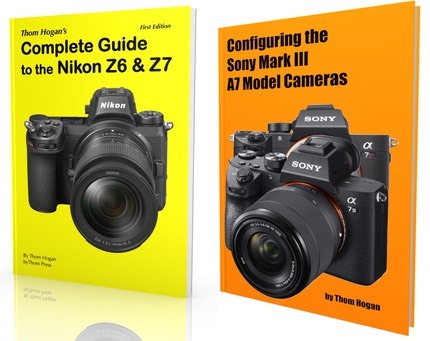 Sony made a very interesting choice in the NEX cameras: they are distinctly small—even the high-end NEX-7 is smaller than some other mirrorless cameras. This comes despite using the large APS sensor. But the lenses so far have been mostly a cognitive dissonance to the small camera size: the kit lens and the companion telephoto zoom are very large, distorting the compactness of the system. This is a system still calling out for two or three more compact, pancake-type prime lenses (and a better version of the one they have, the 16mm). Update: I meant Sony lenses with my last comment. As someone pointed out to me, the 16mm Sony plus the two Sigma primes (19 and 30mm) make a small starter kit. That would give you approximately 24mm, 28mm, and 45mm equivalents. Still would need a telephoto, though.